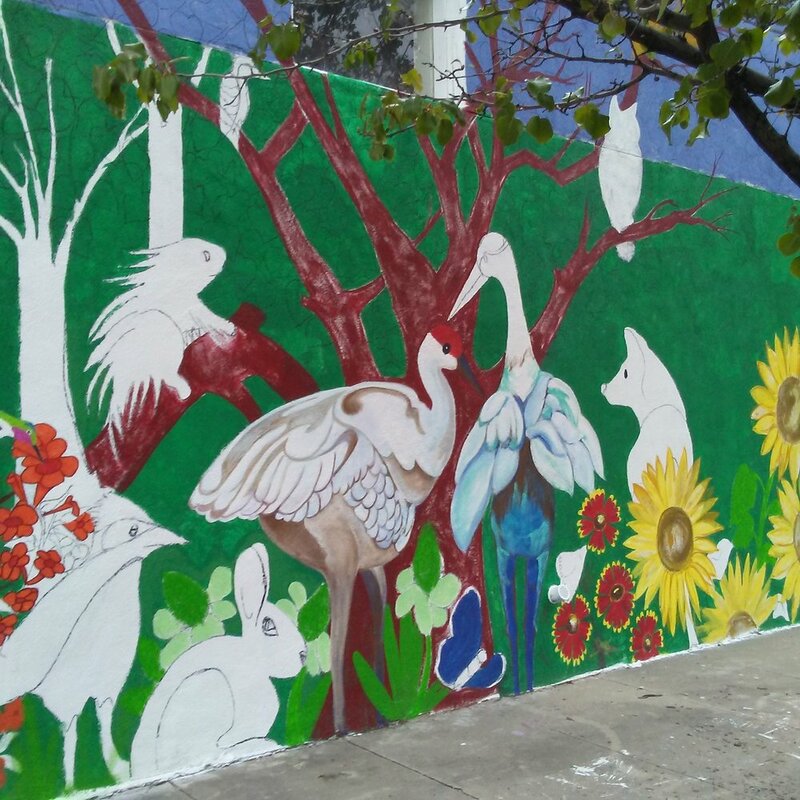 The last half of 2018 was a whirlwind as we hurried to wrap up the Tortuga Bosque mural between bouts of wind, rain, snow, and flu. I learned a lot, being part of that project, and I met and worked with some really great people. Logan and Pax of Tortuga Gallery were kind and generous, in all stages of the project, with their time, money, treats, and open hearts. Tortuga is a hub for creatives, so Denise Weaver Ross and I had no trouble finding talented artists and support staff who volunteered food, supplies, time, and skills to help us realize our vision. I’m grateful to have met sculptor Joel Davis, a meticulous craftsman, whose insightful patter encouraged me and made time on the wobbly sky lift pass easily. Denise and I agree that the persistence of guest artists Lesley Long, Ilene Weiss, Jan Beck, and Heather Linderfelt tremendously lightened our load. Their skill and tenacity populated our mural with joyful flora and fauna that continue to attract visitors from all over the city. Behind the scenes John Stebbins photographed our beautiful wildlife depictions from which Patrick Carr, of Carr Imaging, generously produced and donated more than 75 archival quality giclées as gifts for our sponsors. Oh my gosh… the sponsors, the Sierra Club’s Bosque Action Team, and the staff of Mural Fest all played a part in making this amazing project possible. But this huge endeavor started as a single idea by the talented and prolific Denise Weaver Ross. She designed and managed this project within which a community worked hard, and celebrated well, and left a beautiful gift for Tortuga’s neighbors. Stop by anytime to see the Tortuga Bosque Mural, 901 Edith Blvd SE, Albuquerque NM, at the corner of Edith Blvd and Pacific street. You can’t, and shouldn’t, miss it! Special thanks to Jeff Hartzer, of Bunnytown, for this beautiful winter wonderland shot - January 1, 2019. See this drone view, and more, on Mural Fest’s website. Denise and I take turns painting the upper portions of the mural from the perch of a scissor lift. I didn’t realize how high 25 feet was ‘til I was up there last week. The lift takes up about half the sidewalk width, so working that high put me at the top of the trees that are planted along the curb. It was a breezy, kinda good for ballooning day, and I was concentrating on drawing cottonwood leaves. The sunset peeked over the top of the wall, reflecting off the edge of my eyeglasses, and trees rustled at my back. I was in the zone, at peace with the universe, one with the work at hand. Suddenly, in a flurry of wings and whistles, the birds arrived. One crazy wing nut musta thought my fluff of white hair was nesting material. He veered over the top of the building, winged me in the head, and tumbled into the branches behind me. He musta landed on his feet in the tree ‘cause I didn’t see him on the ground. Every bird in the hood went nuts! It was about ten minutes before they realized it was a no-fault collision and settled into their evening chatter. The next day, when I didn’t encounter that crazy bird, I figured he flew an alternate route. Visit https://www.gofundme.com/tortuga-gallery-mural-fest-project for more information on how you can be part of this community project that beautifies the neighborhood and the Rio Grande Bosque. Waterfowl and otters at the rooftop on the corner of Edith and Pacific. Our signature Turtlezilla on Pacific Street. Me in the tree tops with a soon to be golden eagle. The cottonwood habitat, under the golden eagle, in progress on Pacific Street. The lift was higher than this when that nutty bird clocked me in the head. 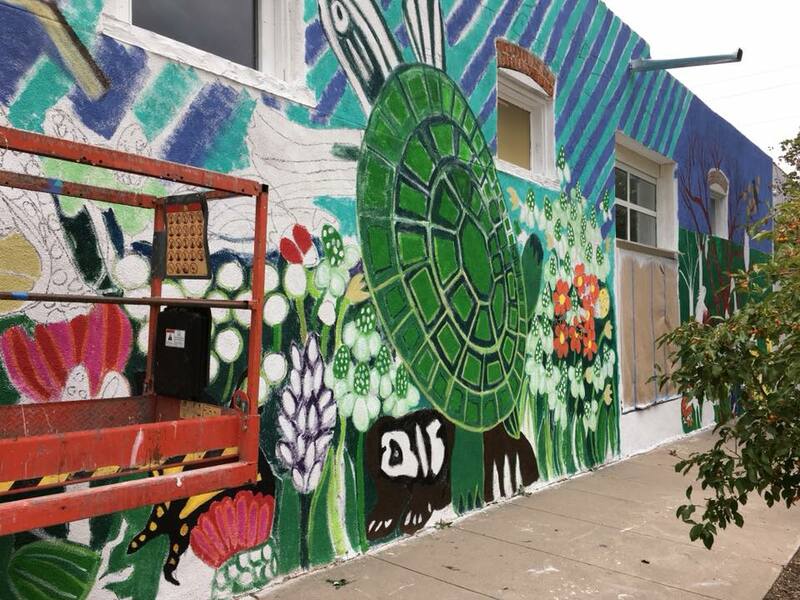 Trying to raise money for the Bosque rehabilitation efforts, mural labor, scaffolding, and other equipment related to the Tortuga Bosque Mural really cuts into an artist's studio practice! This is only the beginning of the Bosque mural project and sponsorship opportunities will be available until the project closes in October. Click here to make your donation through GoFundMe. Mural concept and design by Denise Weaver Ross. Though Denise started this project more than a year ago, my involvement began this week when she gave me photos of flora and fauna of the bosque and two large paper layouts.